If it’s winter in your part of the world then and you’re wanting to make yourself feel even colder then why not check out Icy Wonders, a chilly online slot from Net Entertainment. The ‘wonders’ in question are a selection of human and animal residents of this icy landscape and, to add to the fun, there are two progressive jackpots to win. 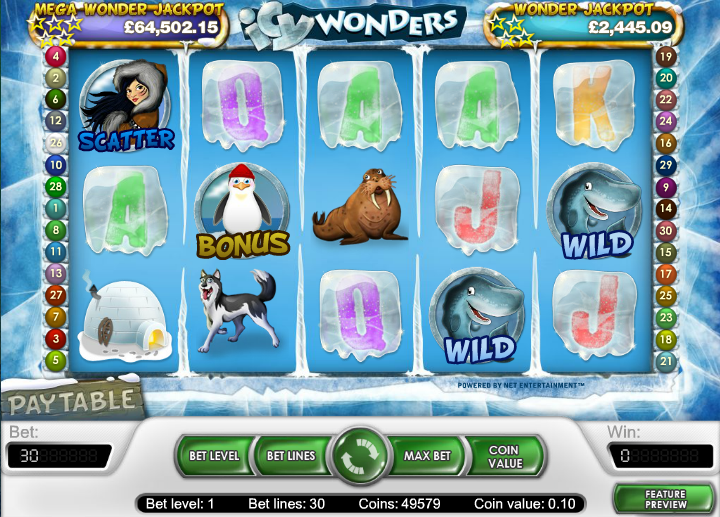 Icy Wonders is a thirty payline slot with five reels and the screen appears to be encased in a solid block off ice. The main symbols are some cheerful-looking creatures – a dog, a walrus, a fish-clutching polar bear – and an igloo complete with chimney. There are three bonus symbols including a whale wild, a foxy eskimo girl scatter and there’s a penguin with a red hat which triggers one of the features. The eskimo girl is not just good-looking, she will also grant you ten, twenty or thirty free spins if you can land three, four or five of the scatter symbols anywhere on the reels. Obviously thirty would be absolutely fantastic but ten is frankly more likely; anything you win during this feature will be doubled and it’s also possible to earn more spins by landing more scatters. Landing three or more of the red-hatted penguins on an active payline will activate this little bonus game. You’ll be shown a screen containing a number of penguins your task is to pick them one by one, revealing a cash prize, until you find the fish skeleton. There are two jackpots available here – Wonder Jackpot & Mega Wonder Jackpot – and you can win them by landing four or five stars on an active payline. These stars appear on the other symbols, they don’t have their own positions and the more you wager, the higher the chance of landing this big prize. Keep playing the maximum paylines because you’ll have more chance of winning the progressive jackpots and the penguin feature if you do – those symbols need to be on an active payline. This is a better-than-average slot which is elevated even further by the inclusion of two progressive jackpots. It’s nice and colourful but you may need to put an extra jumper on to avoid the chills.